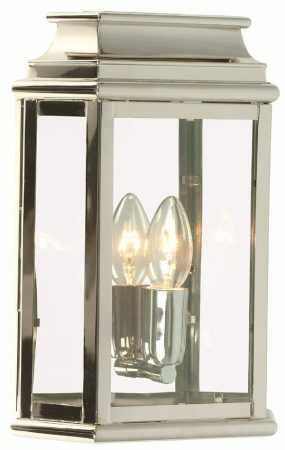 This Elstead St Martins 1 light solid brass outdoor wall lantern in polished nickel finish is rated IP44 and handmade from solid brass using original designs from the pre-Georgian era. Crafted from solid brass and then plated in bright nickel, this wall lantern features a hinged door for easy lamp replacement and clear glass panels, with bright nickel body and back plate for a bright all round light with deep curved beveled top. A typical Georgian style garden lantern. The polished nickel finish to the Olde England collection is a welcome addition to the classic finishes and you can’t help but to imagine this finish on an older property, with a display of hanging baskets nearby and an old watering can to set the scene… Magic! If you are searching for a period outdoor lantern, this fitting should be considered. Fully weatherproof and supplied with a manufacturer’s limited lifetime anti corrosion warranty, which relates to the corrosion of finishes on lights like this one. Locations within 5 miles of the coast are excluded. This classic light is supplied by Elstead Lighting, a British company that specialise in the manufacture and distribution of quality decorative lighting such as the St Martins 1 light solid brass outdoor wall lantern in polished nickel finish and rated IP44 you see here.